There is no overall governing body for thatchers and as such no overall training programme for all thatchers. In the past there was a national residential course held for a few weeks for thatching apprentices where they could attend, be assessed and certificated over the years they worked with their Master Thatcher. This worked with the NOS (National Occupational Standards) Unfortunately this funding has now ceased and there is no longer a government funded apprenticeship scheme nor a venue for holding a residential course. This is partly due to the nature of the subject, finances and difficulty in establishing a course and training facility. There are options, but non residential so please read on. Thatching training therefore still comes down to finding a thatcher to take on a trainee for 4 or 5 years. 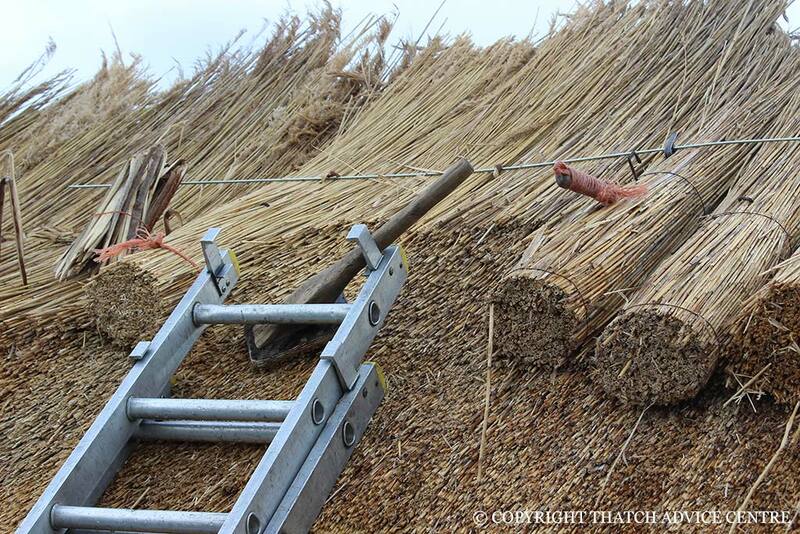 Thatching is a physically hard job, undertaken all year round and not for the faint hearted. You must not be scared of heights nor afraid of getting your hands dirty and rough over the years. Thatching positives outweigh the negatives if it is the right type of work for your personality. It can be boring and lonely and also can be fun, enjoyable and fulfilling if you can make a roof look fabulous for an admiring and appreciative client. Once trained you can either work for an existing thatching business as an employee or a sub contractor or start up your own business. Thatching as a business has changed a lot over the years as have the clientèle who live in thatch. To run a business you also need to be able to source materials, understand thatch building construction, understand and document health and safety, keep accurate paperwork and accounts, communicate with people appropriately (from suppliers, to builders, enforces, customers and of course staff) as well as thatch. 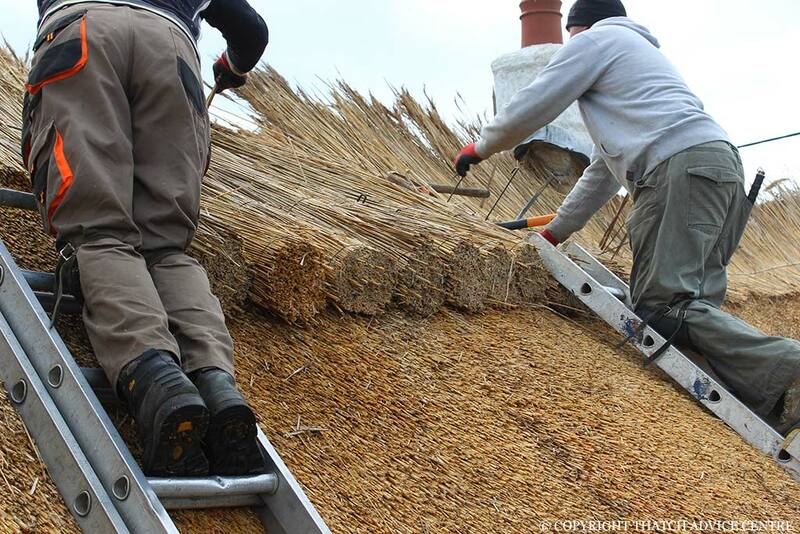 Running your own business is not for everyone but if you enjoy thatching there are options. It is a craft, outdoor work which allows you to work as a team and alone (once qualified) if you prefer. There are 1000s of thatched properties in this country and abroad from old listed properties to new housing developments. In order to train to be a thatcher you need to find a Thatcher looking for a trainee. The term Master Thatcher used to mean a Master of the Craft who had people working under them but now it is used by most thatchers and has less definition. The training usually lasts for 4 or 5 years or maybe longer depending on progress. There is a lot to learn, from which material goes where on a roof, to the 3 main materials used and the differences in application, to twisting spars, and ridging to name a few topics. There is a huge diversity of thatched properties and so the more you work on the better you will understand how to manage different roofs. The thatcher does not have to be a member of any society or association to be competent to train you, although checking their length of time in thatching, contracts and work done is important in making sure they are the right person. It is also important to ascertain before you start what you will learn, how you will learn, approximately when you will learn it and what you will be paid throughout the duration of your training. This clarifies the training for both sides and gives benchmarks to achieve over time. Look at the National Occupational Standards to get an idea of what is involved in training to be a thatcher. Find a thatcher looking for a trainee and agree/understand training terms. On completion you can decide if you want to be assessed for a formal Certification (NVQ2 or NVQ3). On completion of their ‘time’ many trainees stay working for their Master Thatcher, some then work as sub contractors or even start their own business. Ultimately, the skill of the Master Thatcher who teaches the trainee will be the deciding factor on the quality of skills learnt. The skills of using different materials is also one of variance as are regional styles. It is, and has always been, a hard craft to standardise and regulate and perhaps the future lies in recognising those variances and working together for the good of the thatching industry as a whole.